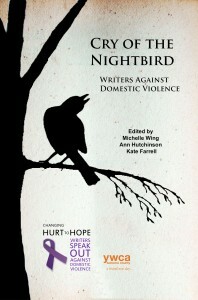 Home » Books » Cry of the Nightbird, edited by Michelle Wing et al. At the 2011 Retreat for Women Writers, Michelle Wing read two poems she had originally written for “Changing Hurt to Hope: Writers Speak Out Against Domestic Violence.” She also met Dora McQuaid and watched her film about her own journey with poetry and domestic violence activism, “One Voice.” She bought a copy of the film, and showed it to her co-workers at the domestic violence agency where she volunteers back in Northern California. Returning to AROHO in 2013, Michelle’s sense of herself as a writer and of her mission as an activist were even stronger. She gave a Mind Stretch talk called “Healing with Words,” and was overwhelmed by the outpouring of support she received from everyone present. In that talk, Michelle said she wanted to create a book, a collection of the “Hurt to Hope” writings. When Michelle returned home for the fourth series of “Hurt to Hope” events, two local women stepped forward, and said, “Let’s make it happen.” As they worked on the anthology, AROHO continued to have an impact. Poet Carrie Nassif (AROHO 2013) has a piece in the final book, and her beautiful photographs illustrate each of the four sections. A quote from a poem by Ruth Thompson (AROHO 2011 and 2013) opens the third section. And always, Michelle was bolstered and inspired by the presence of AROHO throughout the project, simply knowing that her sisters were waiting in the wings.